Please find answers to the most common question in the below section. If you are missing an important question please use contact form. Which License is used for LEPTON? Do I have to pay for LEPTON? No, LEPTON Core is totally free, there are no costs. In case you install some commercial addons license fees maybe charged for these addons. Is it possible to upgrade from WebsiteBaker to LEPTON? Yes, no problem. 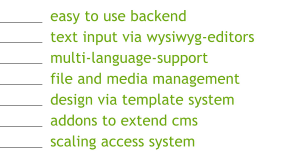 You can upgrade all releases from WB 2.7 Please use this migration script ..
Can WB Templates be used with LEPTON? Yes, but eventually you have to add one of the missing variables to the info.php. Then they should work properly. You can find more informations about info.php in our documentation. BTW a guid can be created here. Can WB Modules be used with LEPTON? Is a "nightly built" available? Yes, LEPTON SVN is accessable for developers who are team members. Please don't use the SVN for productive installations! We are publishing Release Candidates (RC) and Stable Versions and offer them for download. If you are interested in being part of development or you want to become team member please contact us.